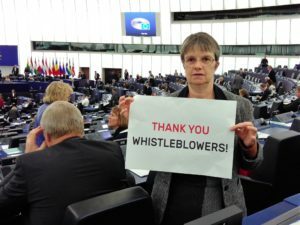 Molly has warmly welcomed a proposal by the EU Commission on a Directive to protect whistleblowers. The announcement today follows the Greens own draft proposal together with pressure from a strong coalition of NGOs, trade unions and journalists. “This is a victory for Greens in the European Parliament. The proposed Directive by the Commission reflects the draft Directive on protecting whistleblowers presented by Greens back in 2016  and demonstrates that, although MEPs do not have formal powers to initiate legislation, they are able to influence the EU’s legislative agenda. “There are elements missing and we would like the Directive to go still further, but we have succeeded in pushing the Commission to act.